Matchy has had great success with his Matchy & Bott EP on Katermukke („Too Late For Loving“ EP) and Stil vor Talent with „Submarine Sauna“ and releases her together with Beatamines. Beatamines himself has been around for some time and has recorded also for Stil Vor Talent, Katermukke, Moonbuutique so paths must have crossed along the lines which lead to this strong cooperation. Their EP begins with „Greyzone“ a tune that from the very start introduces a heavy droning synth and lots of nervous energy in the shape of rhythm elements to make sure it can work a 100% on the dance floor. There is a lot of progression in the track and a lot is unpredictable and that is cool because it intensifies the communication with the dancer… takes him by the hand and leads him through various stages and different dynamics. 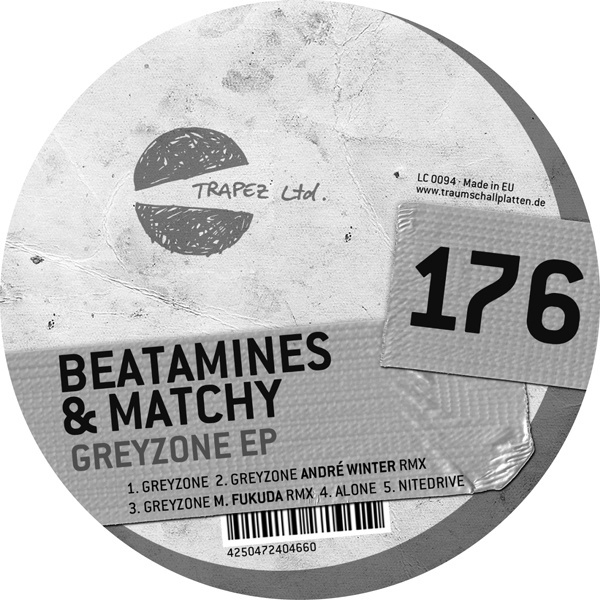 André Winter’s remix of „Greyzone“ in comparison is more linear and predictable and made for a different type of DJ to rock the crowd. Japanese artist M. Fukuda has also remixed „Greyzone“ has a lot more swing in his remix and adds that funkiness to the groove to generate a hypnotic quality. „Alone“ is a melodic techno house track with big epic melodies and quite a crowd pleaser. „Nitedrive“ is as the title reveals an acoustic ride through the night with a lot of haunting FX and some spooky melodies.